Braces aren’t just for kids anymore. In fact, one in five orthodontic patients is over 21. With the invention of more discreet orthodontic appliances such as clear braces and clear aligners, adults feel comfortable stepping out in public during all phases of treatment. While adults can experience the same results as children and teens in terms of achieving a beautiful, straight smile, the treatment can takes longer. This is due to several factors. Because the jawbone in an adult is fully formed, there could be some treatment limitations. In addition to that, gum disease, which is more prevalent in the adult population, could hinder the progress of orthodontic treatment. Before beginning orthodontic treatment, we will evaluate what underlying misalignment issues exist, and we will also check for pre-existing dental problems. We recommend that any oral health issues such as tooth decay and gum disease be remedied prior to orthodontic treatment. 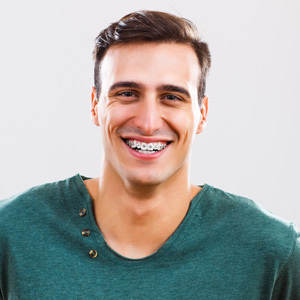 While traditional metal braces are sometimes used for adults, our patients typically choose a more discreet, convenient orthodontic option. We offer high tech clear ceramic braces or Invisalign® clear aligners as well as our high-tech miniature metal braces.